St Brides Spa Hotel is a stylish property with spectacular views over Carmarthen Bay. The hotel has been designed around its clifftop location with floor-to-ceiling windows in the restaurant, some hotel rooms and the spa. There are relaxation rooms, thermal facilities and marine-themed treatments, but the jewel in St Brides' crown is the infinity hydropool where you can enjoy the warm water looking out over the beach and sea below; as stunning in the winter as it is in the summer. "I had a facial recently there for the first time. It was amazing and so relaxing. The products used were great and smelled divine. The whole experience was relaxing and showed just how customer focused this Spa is." "My husband and I have visited on several occasions - we have found it to be a real treat in the depths of Winter. This is a well-designed space, clean, convenient and very tranquil, but the main attraction for us is the spectacular infinity pool which commands the most wonderful views over the town of Saundersfoot, the bay and coastline. The staff are both friendly and professional. Love it, and can't wait to return again soon!!" A light spa lunch is available and served in the dry relaxation room or gallery restaurant. Lunch and dinner are also available in the Cliff Restaurant and Gallery Bar. Afternoon tea is served in the Gallery. There are 24 individually styled rooms, most with a lovely sea view and balcony, as well as 6 two bedroom apartments. Rooms range over several floors showing different aspects of the Hotel. 9am – 6pm every day. Times are flexible to reflect business. There is complimentary car parking at the Hotel for guests (resident and non-resident). 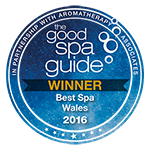 WThe spa is a five minute taxi drive away from the nearest train station (Saundersfoot train station). There is a room especially equipped for disabled access. One of the non sea view rooms has a lower super king size bed and a bathroom with a walk in wet room shower. Chairs are available which are suitable for use in the shower and the hotel can also assist in arranging other necessary disabled equipment. An alarm has also been fitted in the bathroom should you need to gain attention. All areas inside the hotel are accessible. There is full disabled access to the restaurants by means of ramps and chair lifts.